My latest fine art print project is a symbioses of documentary and fine art photography. 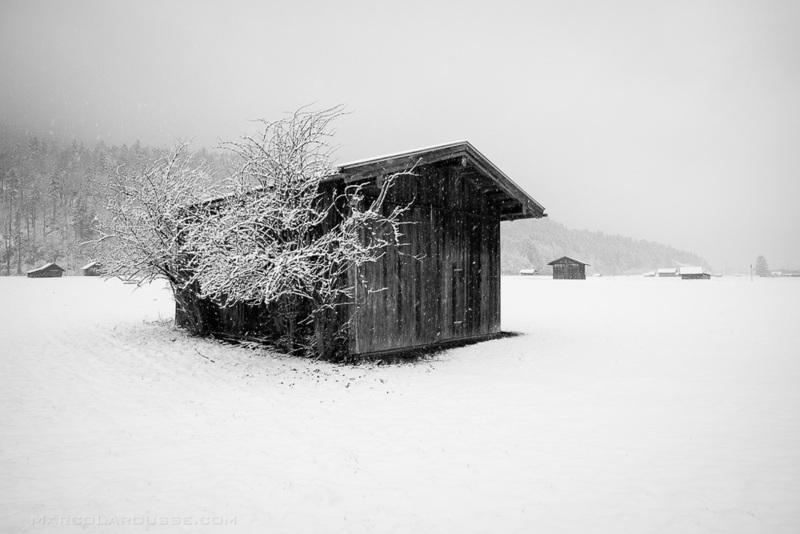 The abundant presence of small hay barns (Heuschober) in the Bavarian town of Garmisch-Partenkirchen inspired me to make these historic structures the main subject of this fine art print series. Some of these hay barns are over 100 years old and each of them is unique. The weathered wood, skew-whiff structure and the sporadic presence of trees growing besides them make them one of a kind structures that are as unique as a fingerprint. These hay barns document how agriculture was run as small scale family farms in this region and that industrial farming still has no space here today. The nine images were captured during snow storm conditions as this portraits best the harsh environment that had to be conquered when living and farming in this region. The images will be offered as a limited original artist print & signed edition - each image is printed on fine art paper framed in museum quality wooden frames with Optiwhite matt/glossy glass.